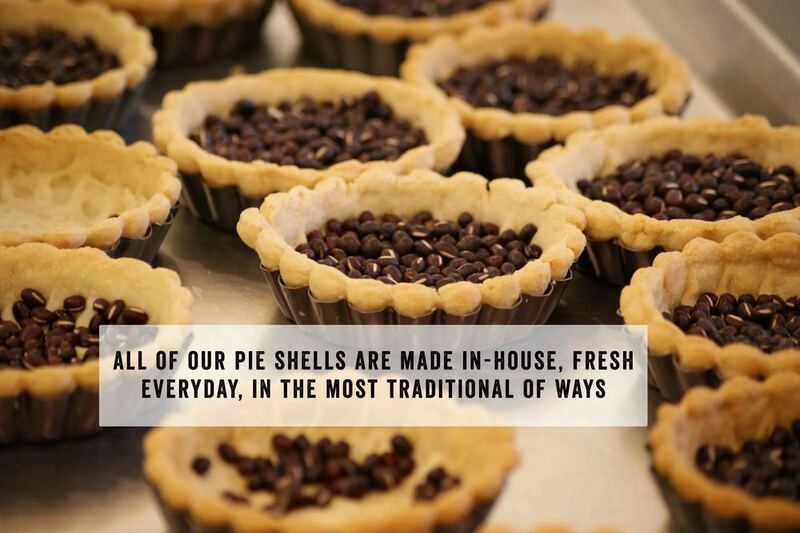 At Atticus Creamery and Pies, we strive for originality and authenticity of flavor. This means that we take great measures to make everything from the lemon curd and vanilla custard to the caramel popcorn on top of our salted caramel pies right in our kitchen, using our unique recipes and techniques. Homemade lemon curd with raspberry jelly and topped with lavender cream using fresh lavender buds from Keys Creek Lavender farm, located in San Diego County. Smooth salted caramel mousse with black bottom chocolate ganache filling and topped with light whipped cream and homemade caramel popcorn for extra crunch. We all love coconut cream pie, and banana cream pie, why not combine both? Bananas and homemade custard fill the bottom of this mini pie, topped with light coconut cream with coconut slices, and toasted coconut bits. One of our bestsellers, the coconut banana cream pie is a favorite among customers who enjoy the smooth, creamy texture of the vanilla custard combined with the light coconut taste and crunchy little bits of coconut. This pie features an earl grey mousse, using the most-loved English black tea, for a sweet aroma, with a black bottom chocolate ganache filling for an elegant and delightful combination. One of Atticus's personal favorites and a must-try! Calling all mango lovers! Mango mousse with fresh mango pieces, topped with fresh mango. Refreshing and light, with intense mango flavor.